On our specials board you will find seasonal delicacies e.g. the platter of the season. Our platters consist of three servings. 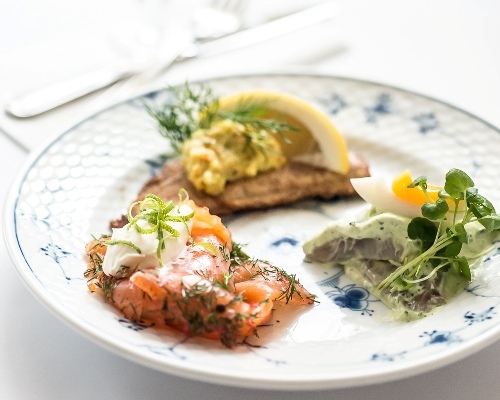 For the Summer platter (pictured) the first serving is herring with chives and “smiling Egg”, salmon cured in fresh herbs and lime, and pan-fried fillet of plaice. Our head chef, Jimmi Bengtsson, has combined the regulars’ favourites with selected seasonal delicacies and composed a delicious winter platter. The winter platter – or our á la carte open-faced sandwiches – taste even better with the flavourfulChristmas brew from Nørrebro Bryghus or an aromatic, home-made aquavit.